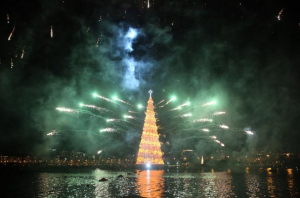 RIO DE JANEIRO, BRAZIL – Rio’s famous Lagoa Christmas tree was officially opened last night in spectacular style, accompanied by fireworks, concerts and ballet shows. The enormous structure sits in the Lagoa Rodrigo de Freitas lagoon in Rio’s Zona Sul (South Zone). It stands 279ft (85m) tall, weighs 542 tonnes, and has 3.3 million bulbs and 65 miles (105km) of tube lights, all of which is mounted on a floating base of some 8,719 sq ft (810m²), according to its website. Crowds were treated to performances by famous singers Gal Costa and Frejat and the Barra Mansa Symphonic Orchestra, and although the event only opened to the public at 6PM in the evening, people had started taking their places from earlier in the afternoon. A number of illegal vendors who were hoping to cash in on the crowds have been caught out by police, it was reported, with many vehicles fined or towed away. Many consider the event – which first started in 1996 and is now in its sixteenth reincarnation – the start of the festive season in the Cidade Maravilhosa, and sits in third place in terms of events in the city after Carnaval and New Year’s. BUT the winner is…………RIO DE JANEIRO. Our TOP Reasons to visit Casa Cool Beans and Santa Teresa…. 2) ART- Start your collection NOW….visit Santa Teresa; the artist haven in the hills overlooking the beaches and Rio. Find the Atelier Chamego Bonzolandia, a trolley-shaped workshop (Rua Aurea at the Montreal Supermercado) where Getulio Damado fashions trash into art. Starting at R$10 you can’t go wrong! 3) THRILL- Ride the BONDE…stepping back in time, or so it seems when boarding the little yellow tram which winds it’s way from Centro (downtown Rio) over the Lapa arches and up the hills of Santa Teresa and back again. Just R$.60 per ride. 6) PEOPLE- The streets of Santa Teresa are overflowing on weekends with people from all walks of life; ideal for people watching and bumping elbows with some of the local artists. But you will be sure to note the warm welcome one receives from the locals! 7) MOUSSE- Our dog, Mousse, has become an international celebrity. Guests from all over the world bring him goodies and send him salutations. We promise he will be wagging his tail upon your arrival and be there for your departure; (but make sure to bring plenty of energy to provide his requested pats!). 8) ARCHITECTURE- WOW….wonder the cobblestone streets of Santa Teresa to see some of the most beautiful turn of the century homes and buildings. 10) Who needs another reason? Just come visit us! Rio is Casa Cool Beans!! !